Hebrew Music was always accompanied by singing, dancing and musical instruments. When the kingdom of Israel was established, Hebrew music was developed systematically. David put men in charge of music in the house of the Lord after the ark came to rest there. They ministered with music before the tabernacle, the Tent of Meeting until Solomon built the temple of the Lord in Jerusalem. Some of the sons of Asaph, Heman and Jeduthun were appointed for the ministry of prophesying, accompanied by harps, lyres and cymbals and the leaders of the Levites appointed their brothers as singers to sing joyful songs, accompanied by musical instruments. The ancient cymbals resembled those in use in our present day. It consists of two circular concave plates of brass, or other metal and when struck together produces a clanging sound. In Psalms 150:5, 2 kinds are mentioned. Referring to two types of cymbals with different tone or resonance qualities (and therefore different sizes or shapes). In the Harper's Bible Dictionary ("Music", p. 670) informs us of "small bronze cymbals 4 to 6 inches in diameter, which may have been played with an up-and-down motion..." Whereas Hebrew Music in the Ancient World (section "Ancient Israel") tells us that the cymbals "are a pair of concave metal saucers clashed together either vertically or horizontally. In the accounts relating to the transport of the Ark of the Covenant, the cymbals are made of bronze. The high sounding cymbals are thought to have been the larger kind that are similar to the ones used in the military bands. They were used by the Hebrews in Divine worship as an accompaniment to the chorus of singers. Paul refers to this instrument in 1 Corinthians 13:1 -"If I speak in the tongues of men and of angels, but have not love, I am only a resounding gongor a clanging cymbal." This is the only verse where the word sistrum is mentioned. An instrument or rattle, which gave a tinkling sound when held upright, when shaken, the rings moves to and fro upon the brass. This word is translated "cornets" by the King James Version. Timbrel - Also known as "tabret" - Job 21:12; Ps. 68:25. Gen. 31:27; Ex. 15:20; Isa. 24:8; 1 Sam. 10:5. It was used on occasions of joy and generally played by women and often accompanied by dancing. 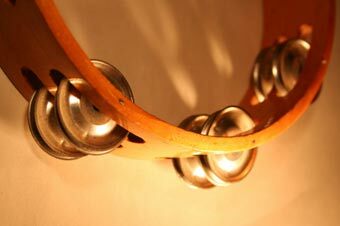 It is reproduced in the "tambourine" used by musicians as an accompaniment to the barrel-organ. The tambourine consists of a single drumhead mounted on a ring with small metal jingles. It can be held in the hand or mounted on a stand, and can be played in numerous ways, from stroking or shaking the jingles to striking it sharply with hand or stick or using the tambourine to strike the leg or hip. It is found in many forms of music, classical Hebrew music, Roma music, Persian music, gospel music, pop music and rock and roll. 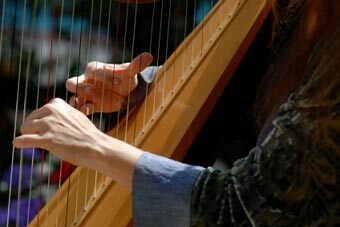 Kinnor is the Hebrew name for an ancient stringed instrument used in Hebrew music, first mentioned in the Bible (Gen. 4:21), where it is now always translated harp. Kinnor - A lyre is a member of the zither family, and was ordinarilly played by strumming, like a guitar, rather than being plucked, like a harp. Since this instrument is found on a Jewish coin (and one minted as part of a nationalistic revival at that), it would seem to be a native Jewish instrument. The psaltery and the instrument of ten strings are one and the same used in Hebrew music. The shape of the psaltery some suppose is like an inverted Delta. Others say it is shaped like a leathernbottle. A skin bottle inverted and an inverted Delta would in general shape similar. Yet others think that it was shaped like a guitar and that it resembled that instrument in its general style. It was first mentioned in connection with the inauguration of King Saul - 1 Samuel 10:5. It was used in Divine worship - 2 Samuel 5:5, 1 Chron 13:8, 10:16, Amos 4:23. It was also used on festive occasions - Isa.4:12, 14:11, Amos 5:5. It was also used in Hebrew music to accompany the voice. The sabbeka or sackbut is a lute or lyre as translated in the King James version. In the Revised Standard version it is called trigon. As we know it today it is a kind of brass instrument like the trombone. Resembled the sambuca of the Romans. Rawlison supposes it to have been a large harp, resting on the ground like the harps of the Egyptians. According to the Smith's Dictionary of the Bible the sambuca was triangular in shape, having four or more strings, it was played by the fingers and gave forth a shrill sound in Hebrew music. The difference between the "horn", the "shofar" , "trumpet", "cornet" is supposed to have been principally in the shape. The later having less of a curve shape than the former. It is also mentioned in Josh 5:5, Dan 3:5,7,10,15. In the passage in Daniel it is translated as "cornet" which is used in Hebrew music. It is the most ancient and simplest of instruments. Originally it was merely a reed with holes perforated at certian distances, whence it derived its Hebrew name Chalil which means bored through. As it's use became general in Hebrew music it was made with great care and materials such as brass, box-wood, horn, bone or ivory was used. Sometimes a double pipe was used in Hebrew music. One part being played with the right hand and the other with the left and both uniting at the mouth-piece. A long, straight and slender wind instrument such as Moses was commanded to furnish for the service of the Israelites (Num.10:2). It was used for notifying the people of the different feasts, for signalling the change of camp and for sounding alarms in time of war. See Num 10:1-10 and Hosea 4:8. It was first used insacrificial rites only on special occasions, but in the time of David and Solomon its use for such purposes was very much extended. The Eternal God commanded Moses to make two silver trumpets for the calling of the assembly, and for the journeying of the camps (Leviticus 10:2). They were blown singly or together, and with different kinds of calls: a simple blowing and a sounding of an alarm. Different synagogue communities today use different rhythms and pitches. Shofar-Ram's Horn - 1 Ch 15:28, Ex. 19:13; Num. 10:10; Judg. 7:16, 18; 1 Sam. 13:3. The shofar is often mentioned in Hebrew Scripture as a warning of war and judgment. An instrument worthy to be used in the praise of God (Psalm 98:5-6). It was blown on feast days (Psalm 81:3). The shofar, trumpets, cymbal, lyres and the harps were used in Hebrew music when the Ark of the Covenant was brought to Jerusalem (1 Chronicles 15:28). Together with the 'Menorah' [seven-branched lampstand] the Shofar became a traditional symbol, as may be seen in ancient mosaics. The Shofar was a meaningful instrument and had manifold uses. The Shofar, at least the smaller sort is capable of producing only a few sounds of indefined pitch. a) 'Tekiah' -- a long sound with a broken ending. b) 'Shevarim' -- alternations between basic and overtones. c) 'Teruah' -- three sounds on rising fifths". The shofar in particular has come to symbolize a call to repentance on Yom Kippur, the holiest day in Rabbinic Judaism.